Renault is the most successful car brand in France. With the largest network of dealers, Renault has been leading the French auto market for decades. If one car manufacturer can be successful with EVs in France, it has to be Renault. Then the Zoe is the right product. It is perfectly sized and designed for French people’s taste and needs, so everybody’s watching closely its sales in its home market. France has said several times it wanted to be an EV-leader. Somehow, it is but when one removes the EVs bought by governments agencies, and a few large companies, the actual number of electric cars bought by French individuals is alarmingly small. 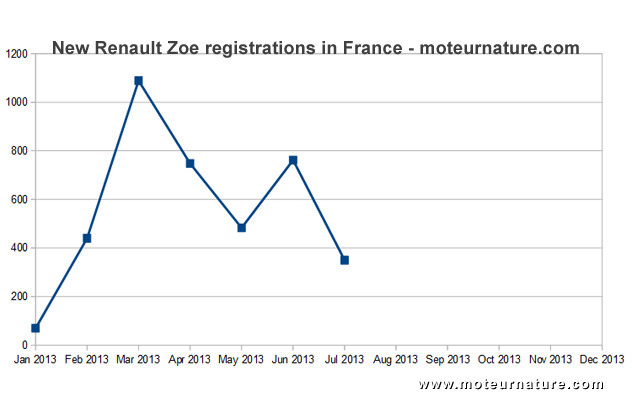 There were only 350 Renault Zoe models sold last month in France. The Opel Zafira or the Alfa Romeo Giulietta were more successful, but the electric Zoe sold better than the Smart Fortwo or the Toyota Prius, so it’s not that bad. The Renault Zoe is selling much less than anticipated, but it’s the best-selling green, electric or alternative-fueled car in France. What’s wrong is that those are still niche markets. Each time Renault sells a Zoe, it sells more than fifteen Clio cars, the similarly-sized model with a gas or diesel engine. We may not expect this to change this year. The French are in love with their diesels, they don’t want EVs.